Unlike today’s society in Japan and worldwide, merchants and traders in feudal Japan were placed at the bottom of the social hierarchy. This meant they were classed lower than the likes of farmers, peasants and fishermen. One of the reasons they were not regarded highly was because people believed merchants were dishonourable people who took money from honest and hard working people. Because of their low social class status, they were looked down upon by the majority in the country. Furthermore, merchants were not allowed to mix with those in other classes, except for business purposes. Despite their low social class, a lot of merchants in feudal Japan were very wealthy. In fact, in the Edo period, they were often the richest social class, having more wealth than those in higher classes. This encouraged more people to become merchants. However, they were not allowed to display their wealth in public. For instance, they were forbidden to wear luxury clothes in public. Moreover, the merchants’ wealth did not lead to higher social class or position. Merchants sat with a geisha. Those in the military class like samurai, daimyo and shogun received set salaries. This, however, was not the case for merchants where they had to rely on the amount they took in daily. Therefore, while merchants had great opportunities to become wealthy, they also carried higher financial risk. Some of the important factors merchants believed for making money included long working hours, keeping the business within the family and good health. Merchants sold a number of different items, from armour and weapons to paper, pottery and textiles. Different regions in the country focused on making and selling different goods. Each region had specialised goods that they could best produce. This led to the production of significant amounts of unique products throughout the country, helping the county’s economy to grow. 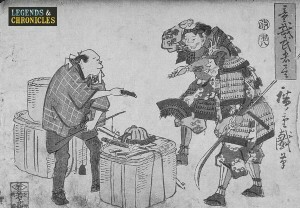 Merchants lent the finance required by the military class to fund a great number of civil wars during the feudal period of Japan. Like how banks work today, they charged interest on the finance they lent. Japan’s trade with its neighbour countries, such as China, Korea and several other countries in the Asia area, was eventually increasing, which strengthened the country’s wealth. Sword blades, books and copper for silk were some of the items exchanged with the foreign countries. At the beginning, the ocean surrounding Japan forced the country to become isolated from the rest of the world. A merchant trading with some samurai. The typical day for merchants and traders started very early in the morning, between 5 and 6 am. The first task for many traders was collecting the goods from suppliers, then set up the points where they could trade from. 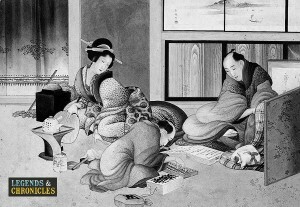 As with many ‘business people’ today, merchants in feudal Japan had very long working hours, finishing work late in the evening. It was typical that merchants kept the businesses going from one generation to the next. Because of this, it was necessary for them to be well educated to learn about economy and running businesses. Therefore, most children of merchant families went to school. Both male and female merchants in feudal Japan wore loose trousers on normal days. Furthermore, men wore black lacquered headgear. On special occasions women would wear silk robes. Kyoto became an important city in terms of the producing and selling of goods. A lot of merchants went to settle in the city, in the same sense as Japanese people today would go to live and work in Tokyo for good high paid jobs. Merchants throughout Japan established trading guild or association, also known as ‘za’. The type of guilds differed depending on the location and products. Some of the famous za in the city of Kamakura included the guilds for rice, fish, fuel and woodcarving, for instance.